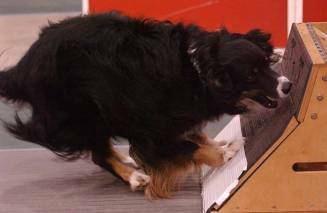 Flyball races offer fast paced action with plenty of excitement for dogs, handlers, and especially spectators. Many teams run all 4 dogs through the course in less than 20 seconds. The NAFA record is now under 16.0 seconds. NAFA tournaments are divided into divisions so that teams compete against other teams of equal abilities. All dogs including mixed breeds are eligible to compete and earn titles in NAFA sanctioned tournaments. Titles are earned via a point system based on the time it takes a dog’s team to complete each heat race. 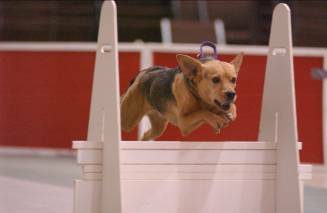 The preceding description is from North American Flyball Association, Inc. (NAFA®) Official Rules of Racing.